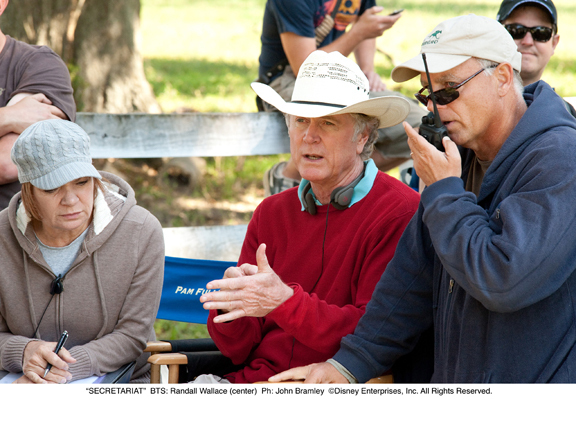 Even before he began production on the new movie “Secretariat,” director Randall Wallace knew the on-location scenes in Kentucky would be crucial. And they did. Wallace and his crew had no difficulty rounding up a huge cast of extras to recreate the crowd scenes of Secretariat’s historic 1973 Kentucky Derby victory – an electrifying track-record performance before a record crowd of 134,476 – and Secretariat’s overwhelming 31-length triumph in the Belmont Stakes. 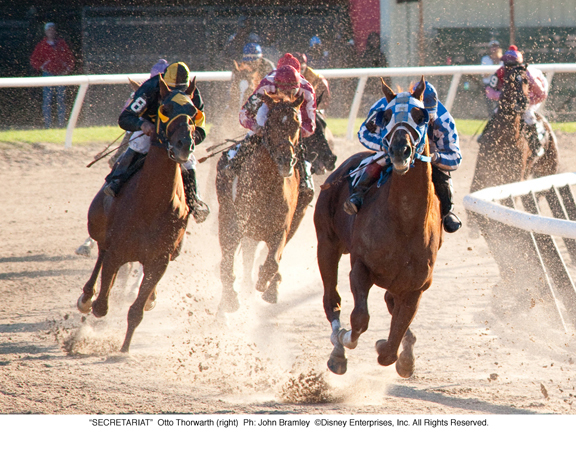 The Derby was shot at Churchill Downs, in Louisville, and the Belmont at Keeneland Racecourse, in the heart of the Bluegrass horse farm country near Lexington. And the director didn’t mind priming the emotional heartbeat of his cast of extras. “The first day of filming,” says Wallace. “I surprised my whole crew by saying, ‘Let’s play “My Old Kentucky Home” and film them singing it. Everybody was looking at me like I was crazy. 1st TurnBut as soon as we started to play it, the crowd, their hearts swelled, and they sang – and the energy of that just spilled into everything we filmed.” The magic of the Derby. 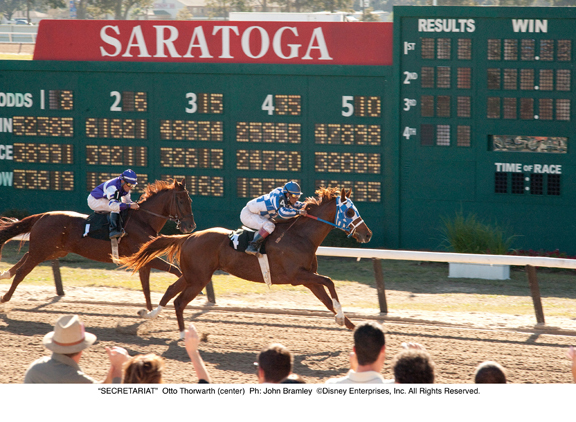 And the enduring magic of Secretariat. It was a role they were born to play. Many, in fact, noted that they had actually been in attendance for the 99th Run for the Roses – just college kids in the Infield 37 years ago. 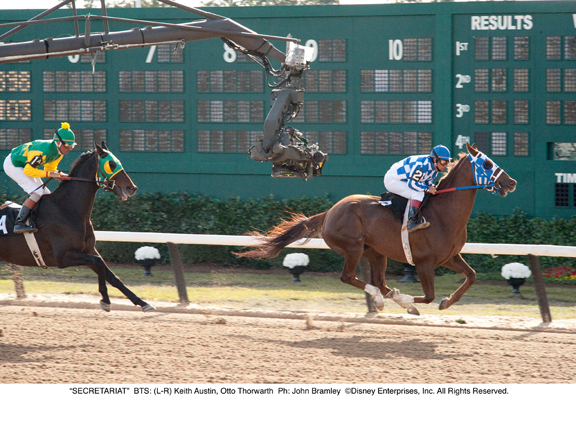 And probably every Kentuckian hired as an extra had been to the track. Sitting in a box or hanging over the rail, if the director asked them to cheer their favorite to the wire – well, these folks certainly knew how to do that. Wallace got an extra burst of energy when Penny Chenery, the owner of Secretariat, visited for the filming of her horse’s Belmont masterpiece. Wallace placed Chenery in a box seat near where the cameras were focusing on Diane Lane, the acclaimed actress who portrays Chenery in the movie. Wallace made a big impression on Chenery at the filming. “Extras are always ignored – or almost always ignored – by film crews,” he says. “They are generally treated like furniture instead of treated like people. I always make a point of speaking to the extras and treating them like actors – because of course, they are. Explaining to them what we’re doing. I want them to know why we are making the movie. “Movies tell us who we are and who we ought to be,” Wallace continues. “I made that speech, then got to cap it off with the grand moment, that this is a fantasy story because ‘right here with us today is Penny Chenery’ – and people just went crazy applauding for Penny. Including the director’s own inspiration. 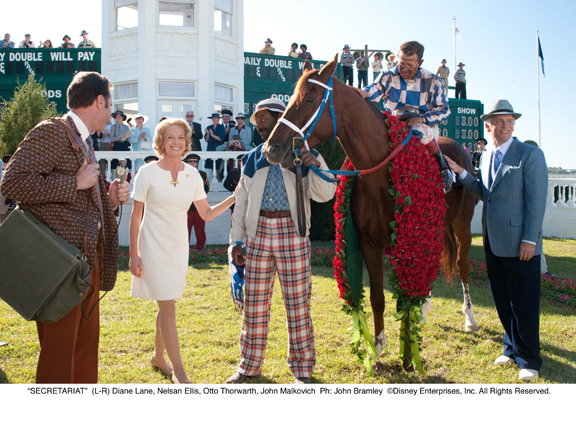 Wallace cast Diane Lane as Penny Chenery. Modestly said. But in reality, Chenery’s looks and vitality added immensely to the glamour of the Secretariat story as it unfolded across the newspaper pages and television screens 30-some years ago. So the choice of a beautiful actress to portray Penny Chenery would be entirely appropriate. Her fans would demand it. “Well, I think they got the right person because Diane is an intuitive, sympathetic actress who reflects her character in the story,” says Chenery. “I watched them film a scene where she fires her first trainer, and she is full of righteous indignation.” Was Penny, herself, full of righteous indignation? Penny Chenery arrived on the racing scene as a novice, assuming control of her father’s Meadow Stable as Christopher Chenery’s health failed – and just as the farm was producing its greatest racehorses. Stepping into a world that had its share of sharks, she successfully managed the racing operation, and “spoke” for her horses to an adoring public. The fortunes of Meadow Stable eventually flagged over time, but Chenery’s stature never diminished. One sports writer spoke for many when he called her the First Lady of the American Turf. And her modesty remains delightfully genuine. “It’s a weird experience to be the subject of this wonderful undertaking,” says Chenery, thinking of the enormous scope of a Disney studio motion picture. “I’d never been to location for a movie. I took my youngest son and his wife and their kids with me, and the kids got roles as extras. There are twelve of us in the crowd scene. Wallace utilized a new filming technique involving very small cameras that can get close to the faces of the horses. “It was my cinematographer Dean Semler, who shot “Dances with Wolves” and “We Were Soldiers,” and just a great number of other things, who came up with the technique. We have cameras right up by the horses’ hooves, and close to their chests. So you can feel the dirt flying, and the danger.” In the end, after attention to all the thousands of details of making a movie, Wallace says he never lost sight of the horse that caught the imagination of the world. “What I found about Secretariat, what inspired me about this story was that we always look for the question of how do we identify with the voice of God,” he says. “In the great stories people always find a voice, whether religious or not, and they have to find a way to answer that call, or their lives would mean nothing. If they could answer that call, their lives would be everything. To me, that calling for Secretariat was greater than anyone could have ever expected it could be. Rather than measure up to his calling, his life exceeded that calling.” But, adds Wallace, “the movie is great fun, as well as moving and dramatic. “In my past work, the subjects had power. The Scottish Rebellion led by William Wallace, the events around Pearl Harbor, the first great battle of the American forces in Vietnam. All those events had dramatic weight. 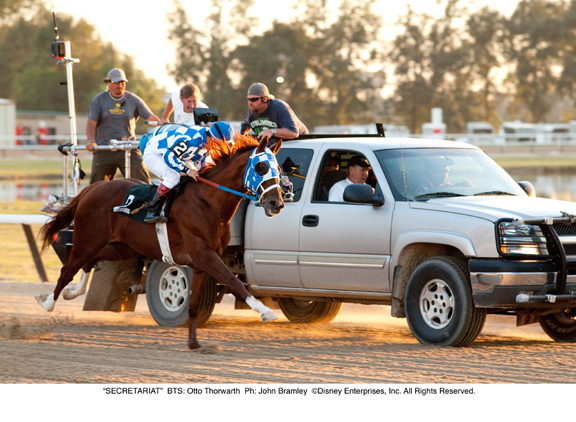 ‘Secretariat’ has dramatic weight, but it also has exuberance. There’s a real joy about it. A sense of unmitigated victory that is rare for any sport.